Google isn’t known for its consumer marketing. If anything, Google is known for not doing much consumer marketing. Given its strong brand and the attention its products get, it hasn’t really had to do much. Put out a product, blog it and sit back while media fall over themselves to cover the launch. Local is a different beast. Reaching people in local markets takes more effort. And Google sure is making it. Google has put on a full-court press in Portland since December for its Hotpot product. The results are mixed: I like the effort, but it needs more local flavor. It’s the largest consumer marketing effort I’ve seen Google undertake (the 2010 Super Bowl ad notwithstanding.) It incorporates out-of-home, joint promotions with small businesses, event marketing, social media and online advertising. It’s also the largest local marketing effort I’ve seen by an internet company since I was at washingtonpost.com in the late 90s. We hosted frequent community events. The Post bought an SUV, expanded it, put in computers (with a satellite internet connection) and drove it around to events at places like the MCI Center. Hotpot is a ratings and recommendations engine that sits somewhere between foursquare and Yelp. Instead of focusing on getting people to write rich, in-depth reviews like Yelp, Hotpot is trying to get people to quickly rate places and write short reviews. It doesn’t have check in functionality (that’s in Google Latitude), but the space provided for reviews is more similar to foursquare tips than it is to Yelp reviews. One of my longstanding complaints about local review sites is that they require users to do too much work to figure out where to go. Google hopes to change that by providing recommendations based on your ratings and presumably the ratings of your friends. This post is focused on Google’s marketing activity; I’ve also written a detailed product review of Google Hotpot. Google is using a variety of out-of-home advertising channels. The marketing assault begins the moment you step off a plane at Portland International Airport. Google has also purchased billboards around town promoting various small businesses. I’ve seen a couple of them. They feature photos of the business as well as a Google map. Split Google places billboard for Pulse Salon. Each half is a full-size billboard. A new-style Google sticker with an embedded NFC tag. But there's no call to action. Google has hired local teams to approach businesses and explain Hotpot. They provide businesses with NFC-enabled stickers. I’ve seen these popping up all over town. These stickers have no Places, Maps or Hotpot branding — just Google. While Google has been effective in getting businesses to put them up, the stickers themselves are ineffective. There’s no call to action — not even an URL. The vast majority of users can’t interact with them because they’re only NFC-enabled. In the U.S., that pretty much means having a Google Nexus S phone. But even if you had an NFC-capable phone, there’s no indication that this sticker can be scanned. Most NFC-enabled cards and devices have an icon with emanating radio waves. Not only does that give people a clear indicator that NFC is present, it inspires curiosity and serves as a subtle call to action. 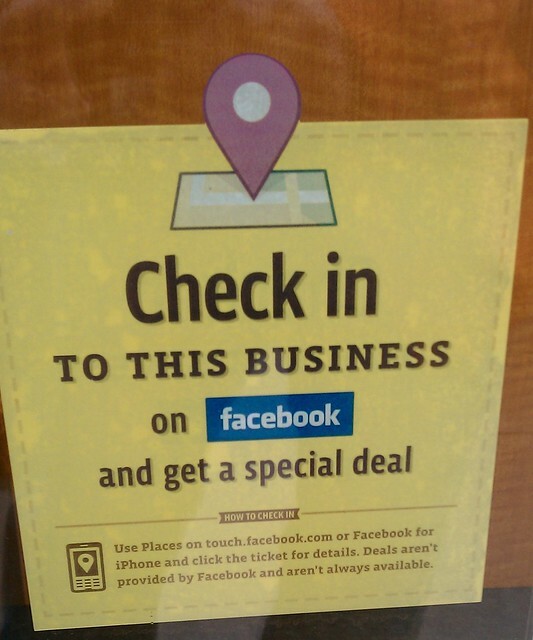 Compare Google’s sticker with this sticker for Facebook deals. Although Facebook’s sticker is much busier, it has a clear call to action. The street teams also help businesses claim their own Places page. Small businesses can also order a variety of Google schwag online for free. Google is giving away pints and custom pint glasses at Deschutes Brewery. 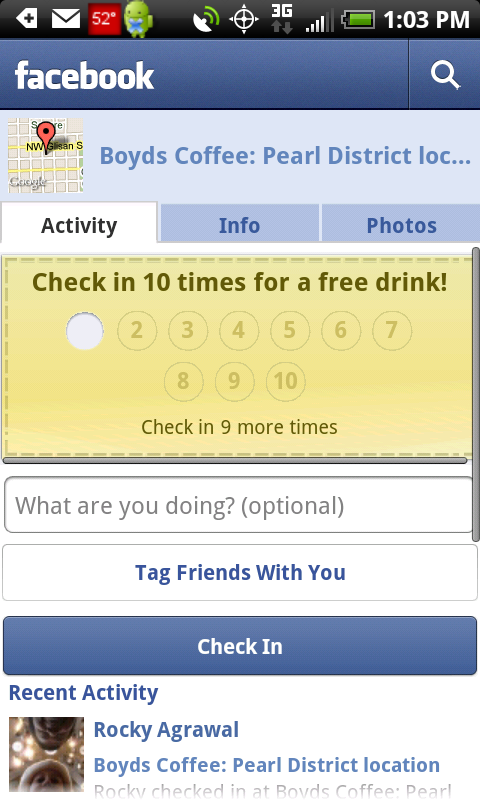 Just show the bartender the Places app on your Android or iPhone. The pint glasses have Google branding on one side and Deschutes branding on the other side. According to one bartender, they had 2,000 of these to give away and the promotion continues until they run out. One of the challenges with running such promotions is staff training. As a consumer, it’s frustrating when staff isn’t aware of a promotion. That hasn’t been an issue at Deschutes; everyone seems to know about it. I’ve even seen bartenders explain Google Places to customers. One missed opportunity here: the pint glasses should come with a promotional flier explaining Hotpot to new users. The free pint is restricted to the Red Chair Northwest Pale Ale. 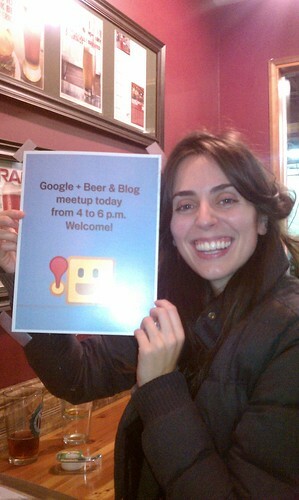 (I’m guessing Google gets a break on the retail price for promoting a newer beer.) Deschutes tracks pints given away in its point-of-sale system. It shows up on the receipt as “Hotpot special”. Oddly, the Deschutes Place page makes no mention of this promotion. 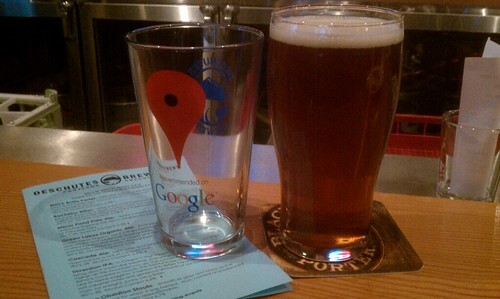 Deschutes also has Google coasters. These don’t seem to be in widespread use. I happened to catch one out of the corner of my eye and asked the bartender to see more. The coasters only have Google Places branding. Unlike Yelp, which punishes businesses for soliciting reviews, Google seems to be encouraging it. A more recent promotion with Powell’s Books wasn’t as seamless. Google is offering free Klean Kanteen water bottles to anyone who shows up at Powell’s, makes a $10 purchase and shows the Hotpot app. Unfortunately, no one told the Powell’s airport store about it. The staff spent about 20 minutes trying to figure it out, calling corporate and other stores. This is a bad use of staff time and not a great customer experience. Google is doing a variety of events in market to promote Hotpot. The events target various audiences including mass market, tech influencers, the young and hip. Google sponsored an event at a Portland Trailblazers game where it gave away 22,000 T-shirts. Google had a team at the Mt. Hood Meadows ski resort giving away hats and mittens. Google was actively soliciting feedback on the product. It also announced its free Best Ever concert series in Portland. Google will be showcasing local bands at a rollerskating rink, on a boat and at a university chapel. Blogs, Twitter and Quora have been an integral part of the campaign. @Tweeting most Google accounts is like talking into an abyss. Schneider has been active on the hotpot blog, Twitter and Quora. Questions are usually answered very quickly. She also curates and retweets activity by Portlanders related to Hotpot. She also provided a definition of her role. Social media is also how they’re managing giveaways. For the concert series, concertgoers will need to get wristbands. Locations for picking up the wristbands will be announced on Twitter. The blog includes guest posts by Portlanders talking about their favorite places in the city. 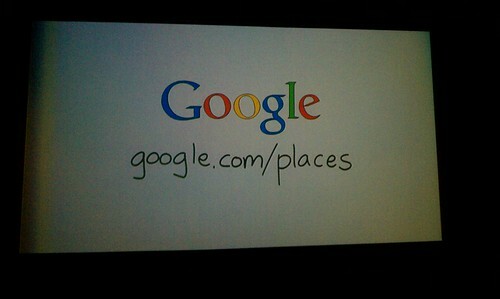 Google is using a variety of different brands in the campaign: Google, Google Places and Google Hotpot. Google appears on the NFC stickers and pint glasses. Google Places appears on the coasters and some of the OOH pieces, including the airport signage. Hotpot appears on the Deschutes receipts (yes, I consider that part of the branding) and the hats given away. I haven’t seen it as part of this campaign, but Latitude is another related Google brand that adds to the confusion. Latitude recently added check-in functionality. While Hotpot has a dictionary definition related to community and sharing, most people I talk to think Google just misspelled hotspot and it’s a service related to WiFi. The whole thing is a mess and should be made consistent. As I wrote this post, I struggled what to call the thing. If you were confused, blame Google. Food carts like this are a staple of the Portland dining scene. Unfortunately, Google Places has the worst coverage of food carts in its database among the major local players. Portland has a unique food cart culture. While food carts have become popular in many cities, Portland is their Mecca. There are more than 300 of them — many of which never move. A lot of them serve gourmet food and they cover a wide range of cuisines. It would be easy to use Twitter to organize flash mobs at a food cart pod, e.g. “Free youcanhascheeseburger! at Brunchbox for the next 30 minutes.” Other promotions could involve scavenger hunts/ratings-based promotions at food carts. Unfortunately for Google, it has a real product problem here. Google Places coverage of food carts is the worst I’ve seen in the space. 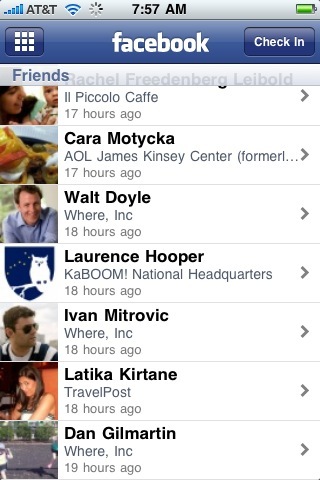 Foursquare, Yelp and Facebook all have much more comprehensive listings. Bing even has a dedicated food cart finder. Events targeting small business owners. Local is a two-sided market. You need businesses and consumers. Engagement on one side will encourage engagement on the other. I would like to see Google educating businesses about how to use the Internet and Google’s tools. While Google has thrown quite a few events, I haven’t seen anything specific to the business community. Cycling. Cycling is huge in Portland, with many miles of bike lanes. Reaching out to that community seems like a sizable opportunity. NFC. I’m not sure why Google is placing such a big bet on NFC right now. But if that’s their path, they should consider distributing NFC microSD cards to Android users in Portland so that they can experience the technology. Social interaction among participants. One of the reasons that Yelp has been so successful in getting people to review places is that they’ve built a rewards system that engenders community among Yelp users. They encourage each other to review. Yelp events further this interaction by providing additional glue. It would be interesting to see Google design events that try to do the same. A customized landing page. 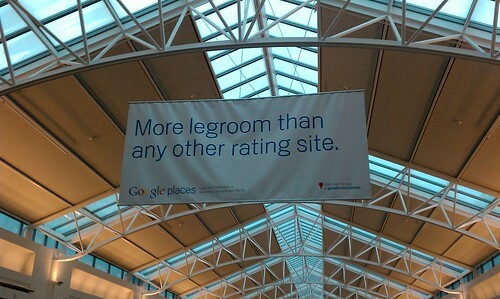 Google is promoting the “google.com/places” URL heavily in its Portland advertising. What’s the first thing you get when you go there? A giant marker pinned to a map… of San Francisco. Details like that matter. This reminds me of HSBC’s long-running campaign about the importance of local knowledge. They emphasize that despite being an international brand, they understand each of their local markets and how things may seem the same can vary across markets. Google’s efforts could show more knowledge of the local market. This actually doesn’t take as much effort as it sounds — spending a week or two in Portland would have provided the types of ideas I listed above. 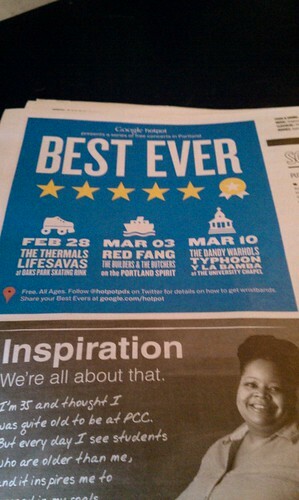 Google is clearly spending a lot of money in Portland relative to other marketing efforts in the local space. Based on what I’ve seen so far, it’s probably in the $700,000-$1,000,000 range. A single promotion like the Deschutes giveaway is more than the entire marketing budget for some Google product launches. Despite Google Maps providing the infrastructure for many of the Web’s local efforts, Google has gotten trounced by Yelp when it comes to ratings and reviews. Unlike Yelp, Google doesn’t have a person in each local market. Campaigns like this are one way to help move the needle. The Hotpot Twitter account has about 1,100 followers. A small portion of these are local businesses. When Google tweeted questions for the Trailblazers game tickets, the first answer usually came in within seconds. Each question had around 12-24 unique responders. The pint glasses at Deschutes don’t seem to be flying off the shelves. Even after they added more signage about the promotion, I don’t see a lot of tables with Google pint glasses on them when I visit. When I ask my non-technical friends about whether they’ve seen any Google advertising around town, the answer is no. Overall, it’s exciting to see Google spend this much effort on consumer marketing and specifically on local. Their efforts will not only help Google, but all of the players in the space.